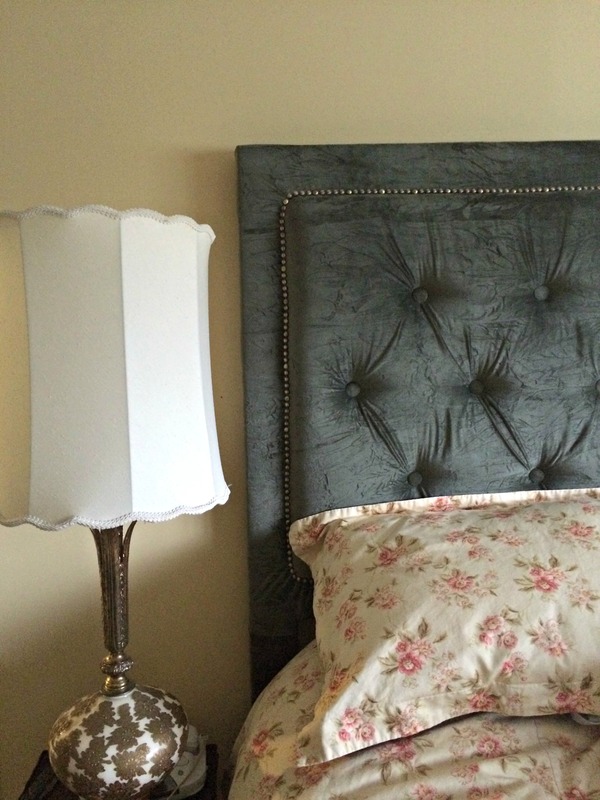 As you will recall, from this post, we were really thrilled with the headboard that we made for our bed. Lucky for us, we weren’t the only ones who liked it! 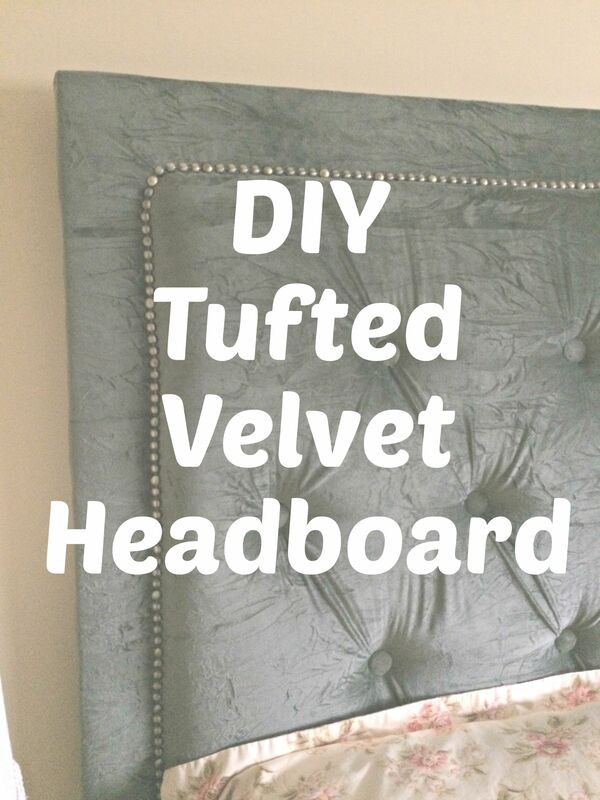 We have had a few requests come in for others, so below is another tutorial for a bit of a different style then this wood framed one on our bed. 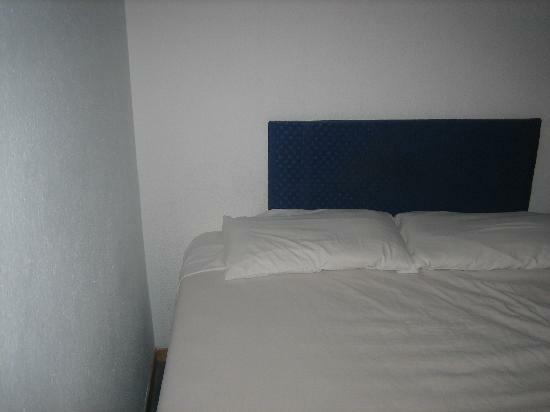 They already had the fabric (old curtain panels), so that was our starting point. 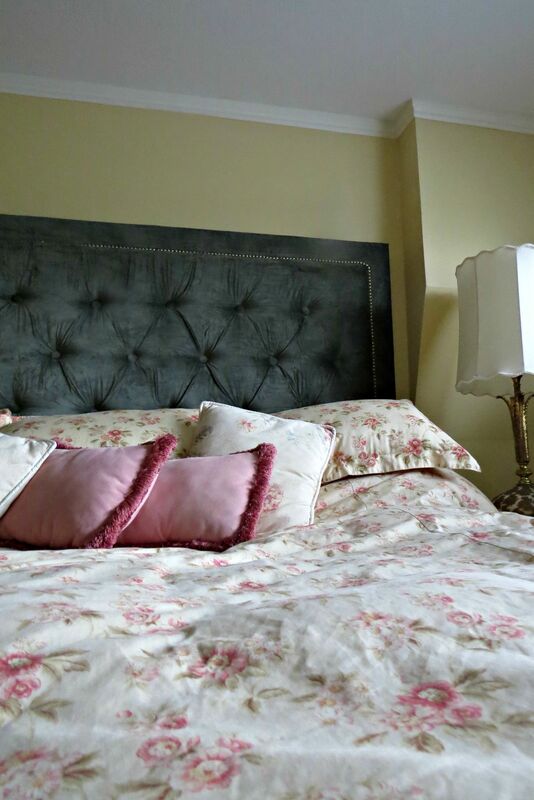 Because of the distinct colour, and the colour palette in the bedroom, it was clear that any metals we used had to be darker, and that the style should really be luxurious and classic. 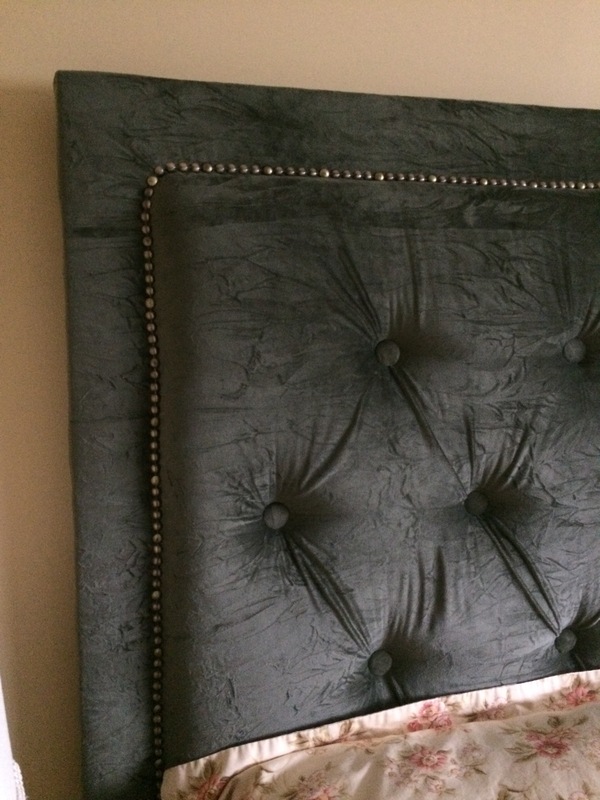 Deep tufting and copper ish nail head trim were no brainers. From there, we built the frame. The complete shopping list is at the bottom. Will explain the steps as we go through the photos. At this stage you will need to identify how many tufts you want and mark them out. Typically, more tufts closer together is slightly more traditional, few tufts further away is a more modern look. Either are great- just look at lots of examples before committing! 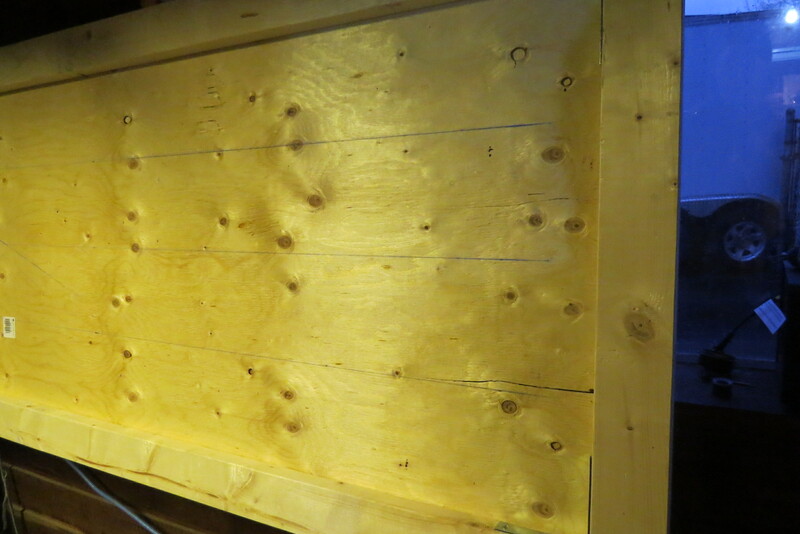 Once you have settled on how many tufts, measure out your marks on the plywood, and screw a hole in each spot. You’re now finished with the wood frame, and it’s time to insert the foam and wrap with batting. Selecting your foam thickness is again a style preference. 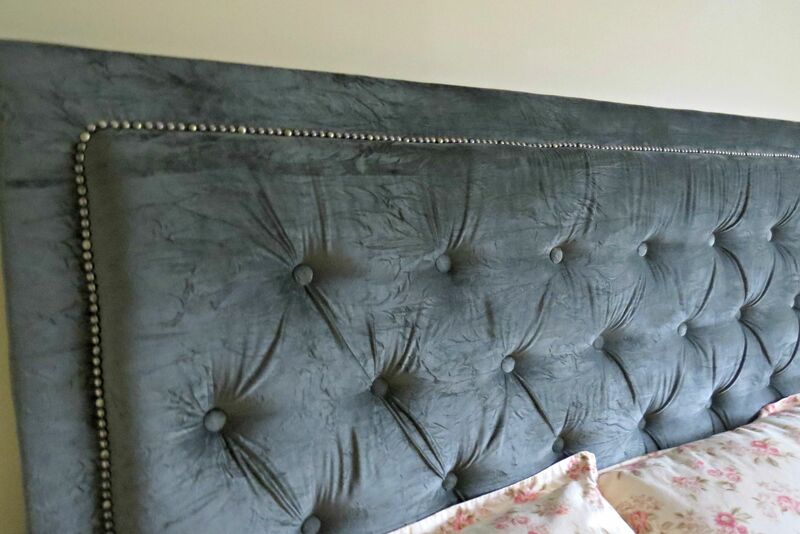 The goal was to have this head board look very deep, and luxurious. 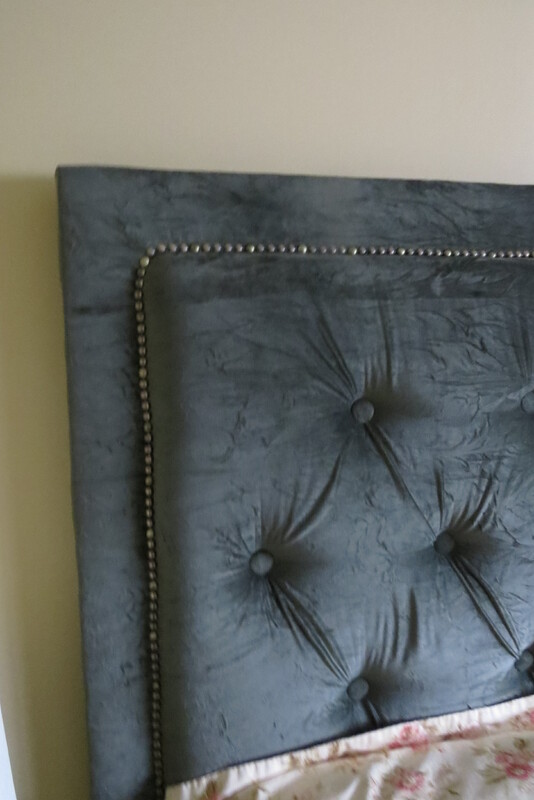 Thick foam with dramatic tufting was the plan. 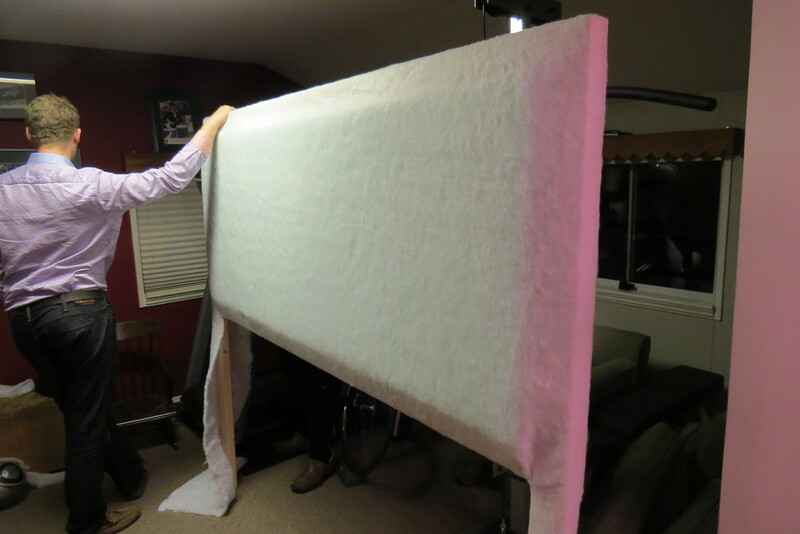 In order to get a deep tuft, a 3 inch foam was bought and cut custom to fit into the frame. 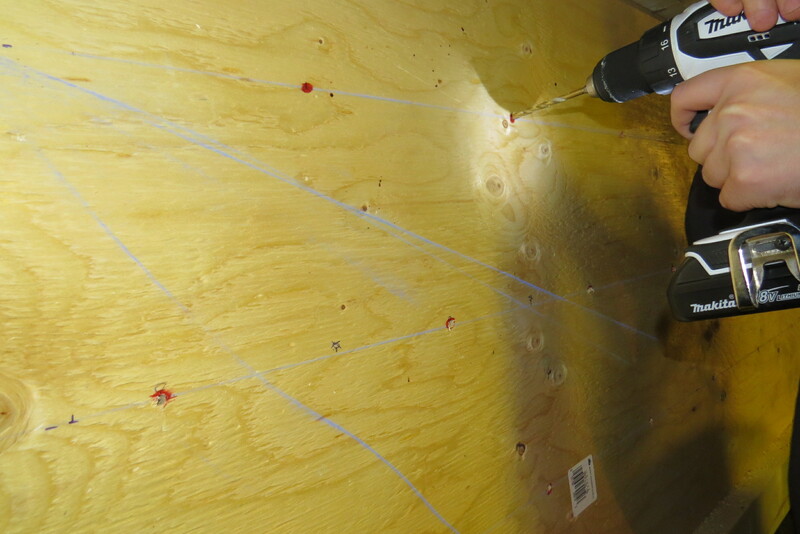 We sprayed the foam with a spray adhesive, and laid it inside. Once all the batting is secured, you can wrap the fabric and begin tufting. This was slightly trial and error until we figured out the best way to do it. 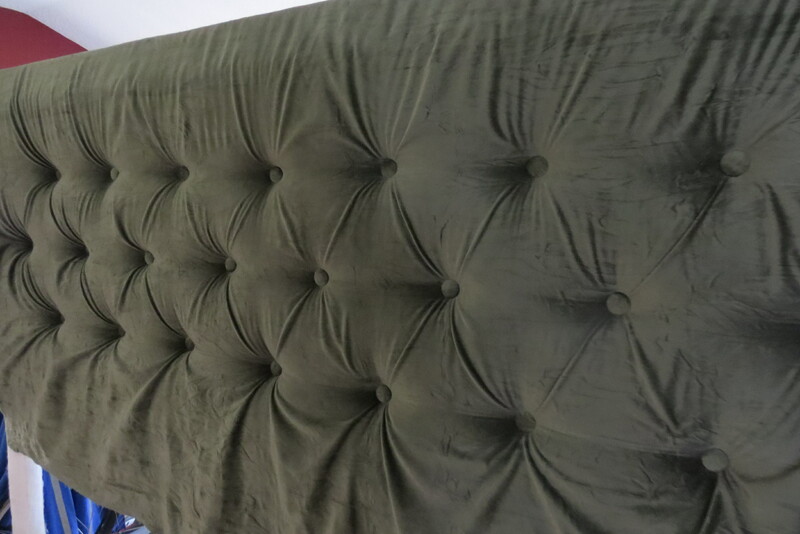 We settled on stapling the fabric on top and on the sides, and leaving the bottom un stapled until we were done the tufts. Of course, you can’t do this step until you have your buttons covered. Now- if you are up for a challenge that will make you want to rip your hair out, then covering buttons with a kit yourself if the thing for you! We once again decided the best look was matching, fabric wrapped buttons so we bought the kit, and cut out a bunch of extra fabric, and got started wrapping. Luckily, many hands make light work and we got them done fairly quickly. I also improved my record from 0 buttons covered on the previous project, to about 10 on this one! 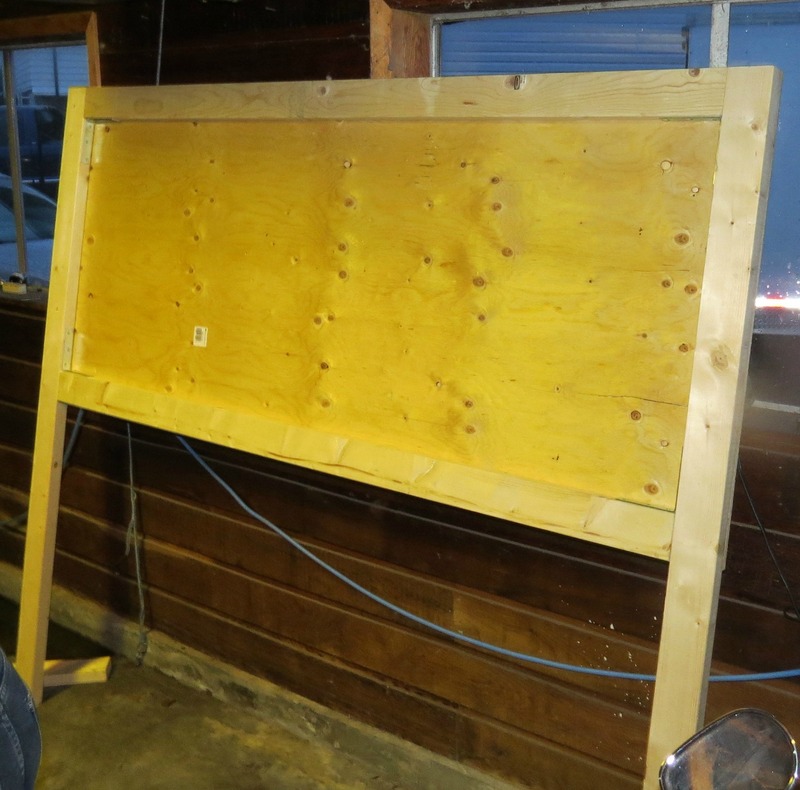 Ok, so now you’re frame is wrapped in batting and it is secured with staples. Your buttons are wrapped, and your fabric is stapled on the tops and sides, with the bottom hanging loose. Now, you take your long (4-6 inches) upholstery needle, thread it and tie a washer to the end of it. From the back side, push the needle through the wood, foam, and fabric; place the button on the front, wrap around a few times to secure, and push the needle through to the back. For extra security, we staple the washer down. In order to get a really deep tuft, we used a hammer to push the button in as far as it can go. This is a two person job, but if you have extra hands, you may want them to hold the frame so it doesn’t move when you are pushing on it. Repeat this for all of your tufts. Now you can staple the bottom of your fabric. Pull it taught around the back and staple every couple of inches. When doing a detailed tuft, make sure you are watching the pleats in the fabric and are happy with how they are falling. At this point you could leave it, but we wanted to make sure this look really polished and store worthy, so we settled on nail head trim which is AMAZING! You can get it from Michaels, or any fabric store in a variety of colours. Basically the concept is that instead of nailing in every nail individually ( and having to line them all up!) you get a long trim, and only nail in every 3 or 4.You want to be sure you put the trim right up close against the foam, but making sure its going into the wood, not the foam. Again, we made this a two person job so that we could get the trim in tight, and the other person could nail it in. And voila! This was starting to feel a bit long, so if I have missed anything please leave a comment and ask! Overall, I definitely like this style a lot more than ours, and it’s really quite easy + quick because you don’t have to wait for the paint or stain to dry.